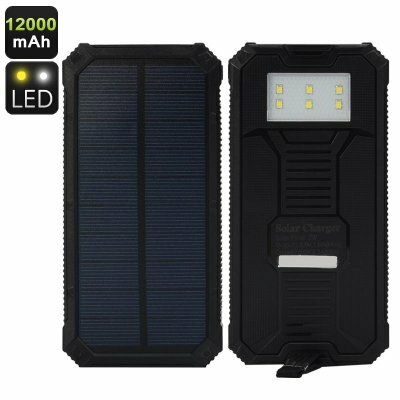 Successfully Added 12000mAh Solar Power Charger - 2.1 Amp USB Output, LED Light, Power Indicators, Carabiner to your Shopping Cart. 12000mAh solar charger is the green way to keep you gadgets powered when on the go. Don't let a depleted phone battery keep you from enjoying the outdoors. With this 12000mAh solar battery charger you can keep your phone, camera, music player, speaker and a whole lot more recharged and ready to go without needing to be near an electrical socket. With a 2.1 Amp as well as a 1 Amp 5 Volt USB output you can charge 2 devices quickly and simultaneously, so its perfect for the outdoor types who just can’t stand to leave their gadgets behind. This environmentally friendly answer to portable power uses a monocrystaline solar panel to top up the battery throughout your day so it can keep on going for longer. A built in 6 LED flashlight has 3 illumination modes, with high, medium and strobe, so It can easily light your way home or draw attention when needed as well as making for a nice lamp to read by on those camping trips away. There are 4 power indications lights that clearly signal how much charge you have remaining and with the micro USB input its quick to recharge once you hit civilization. This 12000mAh Solar power bank comes with a 12 months warranty, Brought to you by the leader in electronic devices as well as wholesale solar chargers..